Can you believe Easter is just around the corner? It just feels like 2016 has been flying by. Today I have a neat book to share with you perfect for the Easter holiday. 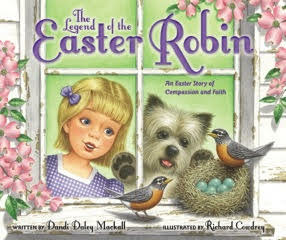 The Legend of the Easter Robin: An Easter Story of Compassion and Faith by Dandi Daley Mackall. This book takes an old Pennsylvania Dutch tale about how a robin gets her red breast and transforms it to a full story with a sweet grandmother sharing the tale to her granddaughter. This book really touched my heart because it brings the focus of Easter to the true meaning in a soft, sweet way. By sharing the Robin's story we see Christ dying for us on the cross. In our homes we use books to learn all about God - first of course bible stories but often stories like Easter Robin too. It is an excellent way to start an engaging conversation with my five year old. With Resurrection Sunday just around the corner - we all need to be reminded of Jesus' blood he shed for us. I'm so happy to have read this story and to be able to share it with my family - and yours! In the center of the nest lay one perfect egg, the color of a spring sky. The father robin sat on a branch nearby, guarding his family. Tressa spotted raccoon tracks below and a blue jay eyeing the nest. “Gran, how are we going to keep the egg safe?” “We’ll have to leave that one to the Creator,” Gran said. Robins have built a nest on the window ledge at Grandmother’s house! Tressa is thrilled―and concerned. What will happen to the sky-blue egg laid by the mother robin? As more eggs appear, Tressa witnesses the daily drama of the robins’ nest and learns how God cares for all creatures. Besides watching the birds, there are Easter eggs to color. And there is a very special story to hear―a tale of long ago about one small bird with a very big heart. How did the robin get its red breast? Tressa is about to find out as Gran tells her the story of the Easter robin. Brought to life with colorful, tender illustrations, The Legend of the Easter Robin will captivate and teach your child about compassion and faith. One lucky reader will win a copy of The Legend of the Easter Robin! I would love to win this for my little granddaughter - she just loves robins, and the message looks so sweet. I'd like to win this for my grandson!